Jo explained; “She was 79 years old when first diagnosed, but we had seen her getting more forgetful and took out a Power of Attorney in 2011. 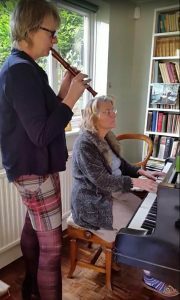 Gradually we started to organise the running of her house and her life and appointments more and more; at the same time I was still running my own home, working and looking after my own children. In 2013 she had a memory test, but it was only seen to be mild cognitive impairment. We felt it was much more than that and requested another test. While we were waiting for this she had a gastric illness and a suspected stroke and it was at this time she had another scan which showed the dementia. Her life, quite slowly initially, started to get smaller and more limited. After a few years she had to stop driving so her independence decreased, and she did not always remember arrangements she had made to meet people, so she grew increasingly isolated. She was also finding everyday tasks, such as shopping and washing clothes, difficult. After her diagnosis the council arranged for carers to come in twice a day, but she certainly didn’t feel like she needed carers; that wasn’t really the sort of help she needed – she actually needed a little practical help and most of all, companionship. Jo approached Share & Care Homeshare because she believed that having a Sharer present would enable her mum to stay in her home for longer. “We didn’t feel that she was ready to go into a care home, although her memory was failing her and her care needs had increased over time. She was less independent, and no longer liked being on her own, but we aren’t able to be with her all the time. She loves company! 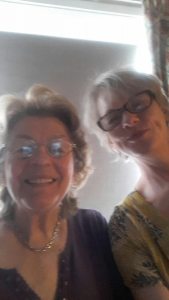 Although she had carers popping in, a weekly visit from a home hairdresser, and friends who would visit during the week, we felt that having a Sharer there would make up for the times when we were unable to be there, and that this would make such a positive difference to her (and to us). We were also relieved to know that with someone living with her, she wouldn’t feel so isolated and lonely. Another bonus was that a Sharer could feed her cat, meaning she could spend a few days away at her partner’s house. How did you hear about Share & Care Homeshare? How did the finances work? “When she was diagnosed with dementia, mum was financially assessed and she was deemed to have to pay a certain amount – capped at £114 a week – towards whatever care she needed. At the time Judith moved in, we had had to step up the care (originally two short visits a day) adding in evening and weekend visits, and this meant that the council was having to fund an extra £60 per week. “When Judith came we were able to reduce the evening visits and weekend visits, which drastically reduced the amount the council was having to pay towards mum’s care. Initially mum was paying Share & Care’s agency fee – just £120 per month because of where mum lives. However, I approached mum’s council to ask if Share & Care could be included in mum’s care plan. The council absorbed it into mum’s cap as they realised that the other care visits had been reduced as a result of Judith’s placement so it was saving them money. The council ended up paying less than they had when mum just had the evening half hour visits, and yet mum was getting so much more time and support from having Judith living with her. The council told me; ‘it is such an ethical programme and that it should be rolled out in councils across the country’. “Share & Care gave us a year’s grace”. “I came from the background of having been a nanny and I was looking for a place to live. I had no knowledge of Share & Care Homeshare and then I saw this, and having been in a role of nanny and mother, I thought it would be ideal. There was monetary consideration obviously too, it would save me money. I wanted to find out about it. “On meeting Jennifer I thought, ‘this would work’. Yes she has Alzheimer’s but she is a lovely person who has had a wonderful life, and we got on well. Our shared love of music was an important factor in our relationship. Share & Care picked up on that shared interest. It is important to have something that connects people. If she was getting anxious I could change the whole atmosphere by putting on music. “Homesharing was a huge learning curve for me and in hindsight I took on perhaps too much as I was doing a job and my studies, and I wanted to cook a proper meal each evening. Cooking was important as it was something we were doing together. She always wanted to help and it was important that I let her help. I did the cooking, and she did the cutlery; she loved to order the cutlery. “The challenges were if she and I were tired, just like normal people, and I would get the same questions again and again and that was challenging. You have to watch out for those times and learn to recognise them. We would both go to bed at 9pm, which was fine by me. “I would say I could homeshare again, but not while I am studying too. I could combine homesharing with a job, but not job and studies. We take note of your activity, and will spread it within our possibilities in Spain.